Regret gets a bad rap. We are often admonished to avoid this feeling at all costs. However, as with most sweeping statements, casting off regret as completely negative is an oversimplification. What exactly is regret? Scholars describe it as a cognitively enriched emotion that is fueled by a feeling of responsibility for negative outcomes of personal choices. In other words, we experience regret when we face negative consequences of our acts, especially when we are aware that alternate choices may have provided a better outcome. Does Regret Serve a Purpose? Research from the areas of neuroscience and evolutionary psychology indicates that the unpleasant feelings we associate with regret may serve two purposes. First, it alerts us to situations that are inconsistent with the interests of well-being, compelling us to make corrections for the sake of future well-being. Secondly, memory and emotion are intricately connected. This simply means emotion plays an integral role in learning. Research informs us that the more emotional an experience is, the easier it is for our brains to encode it into memory. Correspondingly, the unpleasant emotional experience we refer to as regret may serve the purpose of ensuring we remember and learn from past experiences. Our brains are designed for the task of making sense of the world, with the overarching goal of protecting us from danger and demise. Therefore, similar to an antivirus program on a computer, our brains are continuously scanning and interpreting so that we can create a sense of order in the form of expectations, which ultimately helps us to avoid potentially harmful situations. Naturally, these expectations are based on what we’ve learned through previous experience. On the most basic level, experience-based learning occurs through our experiences with cause and effect. Memory helps us to learn that certain decisions and behaviors lead to specific consequences. Regret, therefore, is a mechanism that compels us to stop and deeply consider something that has caused disruption to our well-being, and facilitates encoding it into memory. Simply put, the cognitive component of regret helps us to make connections between cause and effect, and the emotional component (i.e., the unpleasantness) ensures that we never forget the lesson. Can Regret Be Used as a Tool? Regret in and of itself is not bad – it’s the way that we handle it that presents a potential problem. When managed properly, regret can be a mechanism for growth: It triggers mental inspection; helps us to understand relationships between behaviors and detrimental consequences; and memory insures that we are able to compare similar situations with past experiences. Overall, it is a process that is designed to help us to develop insight and make better decisions in the future. The down side of regret, however, occurs when our thinking gets stuck on wishing we could change the past. Although it is healthy to look back on situations to examine our mistakes, when we continue to inspect and reinspect, regret is no longer productive. When looking at the past, more is not better. Therefore it is important to understand the difference between a glance and a stare. A glance allows us to examine a situation just long enough to see the mistake, extract a lesson, and then quickly move on. However, staring at the past is often counterproductive. When we get stuck in a perpetual state of regret–simply wallowing in the mistake instead of focusing on the lesson–it becomes emotionally detrimental and can ultimately lead to depression. The key to managing regret is in understanding it is a normal emotion that all humans experience to some degree, and that it actually serves an important purpose. Therefore, it may be more beneficial for us to view regret as a tool – something that triggers us to actually SEARCH for the lessons provided by negative consequences – than as a negative emotion that should be avoided. If we can become adept at finding the lesson, then we can recognize when regret has served its purpose, and instead file away the lesson versus the regret itself. When we experience regret, it is a sign that we wish we could have done something differently. It means we recognize and desire better experiences for ourselves. Without regret, we may not recognize when we could have made better choices, which would make it difficult for us to grow from our experiences. From an existential standpoint, regret is an important mechanism that ensures that we process the meaning of our experiences. It protects us by guiding us toward less disruptions of well-being, which in turn maximizes our existence. Therefore, regret is neither positive nor negative; it is simply a human emotion that coerces us toward improved decision-making. It is evidence we possess an inherent desire to thrive, which is an important, unavoidable aspect of human nature. How often do you feel regretful? How have you managed regretful feelings in the past? 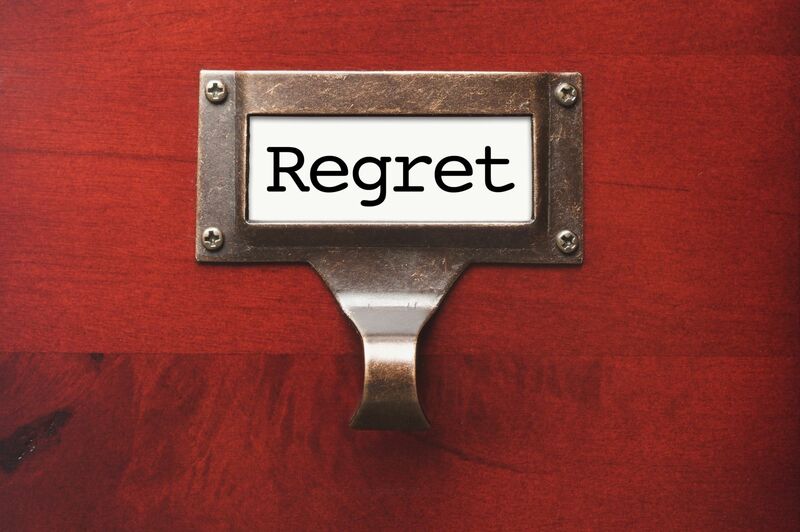 Can viewing regret as a tool help you to manage negative consequences differently? Haselton, M.G. & Ketelaar, T. (2006). Irrational emotions or emotional wisdom? The evolutionary psychology of emotions and behavior. In J. P. Forgas (Ed. ), Hearts and minds: Affective influences on social cognition and behavior (pp. 21-40). New York: Psychology Press.